The other interpretation of the third virtue of Ikebana is that flowers can give us a profound pleasure, which is beyond words. While flowers growing in the garden belong to the everyday worlds, cut flowers belong to a different realm. In Ikebana only cut flowers are used. As soon as they are cut, they begin to die. Ikebana artists are trying to give eternal life to mortal objects, and in trying to do so they go through spiritual experiences. You may not be able to experience that depth of feeling from the start. 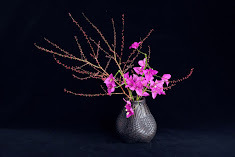 However, many students of Ikebana soon notice that they find flowers more beautiful than ever before. This is the first step toward the appreciation of non-verbal communicative power of flowers. In this month’s work I used stapler to fix Spanish iris leaves. I put Hydrangea flower off centre and added white Madagascar jasmine behind. You may notice a harmony of curbing lines, those of leaves, flowers and container. To me, the combination of green and white somehow creates an imaginative, even mysterious space.